Swaziland lies in the South African region, it looks like a dot in African Flag and is a landlocked country. Its neighbors South Africa and Mozambique offer their borders to carry and import goods in and out of the country. It is one of the smallest countries in Africa. The capital city and seat of government areMbabane while the royal capital is Lobamba. English and Swazi are the official tongues/languages of the country. 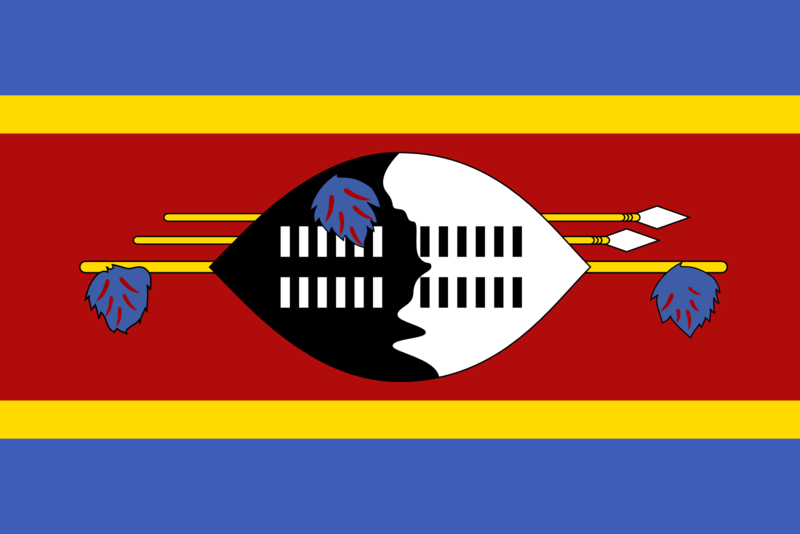 The national flag of Swaziland was adopted on October 6, 1968, a month after it gained independence from British Colonial rule. The flag is complicated in its design and structure. It is used both as a state and military flag of the country. The flag was proposed and given by King Sobhuza II of the Swazi Pioneer Corps many years back before the independence in 1941. The flag was recognized as the national flag of the country by the College of Arms in 1967, it was the same day when the flag was hoisted for the first time. The red in the flag symbolizes the battles fought in the past. The blue color is the sign of peace and prosperity. The yellow represents the natural resources of Swaziland. In the center lie the Nguni Shield with two traditional African spears, it is a symbol of protection of Swaziland from its enemies. The white and black colors also show that there is a unity among black and white-skinned people. The four horizontal stripes i.e. two blue at the top and bottom, the center stripe in red color, the two yellow linings bordering the red colored lining. There are two blue colored feathers of widowbird and Lourie in the center that were used by the King in the past. There are also two spears, a traditional Swazi fighting stick, and three Swazi tassels also called as tinjobo.